The Isle of Dogs, locally referred to as the island, is a geographic area made up of Millwall, Cubitt Town, Canary Wharf and parts of Blackwall, Limehouse and Poplar. It is in the East End of London and is bounded on three sides (east, south and west) by one of the largest meanders in the River Thames. The northern boundary has never been clearly or consistently defined but many accept it to be the (former) line of the West India South Dock. 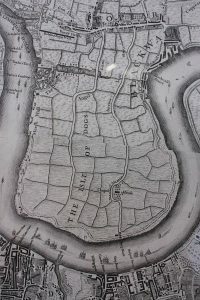 The whole area was once simply known as Stepney Marsh; Anton van den Wyngaerde’s “Panorama of London” dated 1543 depicts and refers to the Isle of Dogs. Records show that ships preparing to carry the English royal household to Calais in 1520 docked at the southern bank of the Island. The name Isle of Dogges occurs in the Thamesis Descriptio of 1588, applied to a small island in the south-western part of the peninsula. 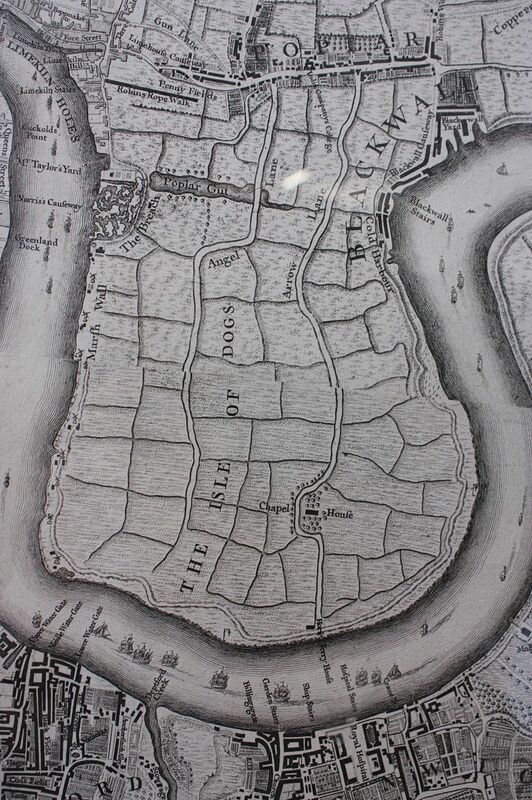 The name is next applied to the Isle of Dogs Farm (originally known as Pomfret Manor) shown on a map of 1683. At the same time, the area was variously known as Isle of Dogs or the Blackwell levels. By 1855, it was incorporated within the parish of Poplar under the aegis of the Poplar Board of Works. This was incorporated into the Metropolitan Borough of Poplar on its formation in 1900. After the building of the Docks (especially the West India Docks and the adjacent City Canal), and with an increasing population, locals increasingly referred to the area as The Island. This area includes Millwall, Cubitt Town, and Blackwall. The south of the isle opposite Greenwich was once known as North Greenwich, now applied to the area around the Millennium Dome on the Greenwich Peninsula. Between 1986 and 1992 it enjoyed a brief formal existence, as the name Isle of Dogs was applied to one of seven neighbourhoods to which power was devolved from the council. The neighbourhood was later abolished. It was the site of the highest concentration of council housing in England but is now best known as the location of the Canary Wharf office complex. One Canada Square, also known as the Canary Wharf Tower, is the second tallest habitable building in Britain at 244 metres. The peninsula is an area of social extremes, comprising some of the most prosperous and most deprived areas of the country; in 2004, nearby Blackwall was the 81st most deprived ward in England out of over 8,000, while the presence of Canary Wharf gives the area one of the highest average incomes in the UK. Lincoln Plaza was the 2016 winner of the Carbuncle Cup for the year’s “worst new building” and The Times described it as “mediocre at best, ugly at worst”. This is a holding page for the coming streets of the Isle of Dogs feature.